This year’s trendy kitchen gadget is the spiralizer, which turns vegetables (and fruit) into spaghetti-like strands. I’ve already used it to make these sweet potato waffles which were much tastier than I expected, and really healthy. I hadn’t successfully made ‘spaghetti’ out of it yet – I did spiralize a carrot, and bring the strands to the boil, at which point they turned to complete mush. Lesson learnt! This time I had a courgette (zucchini) in the fridge left over from making vegetable kebabs for a barbecue and remembered that courgetti was one of the first recipes I came across for the spiralizer – courgette spaghetti. You can serve it with whatever you like; I also had some tomatoes and red pepper left in the fridge from the barbecue and found this recipe from Hemsley and Hemsley, two sisters who have a healthy eating website and recipe book. They recommend eating the courgette raw but I didn’t really fancy that as I don’t even eat courgette at all normally, so I decided to fry it in a little butter. Be aware you don’t get a huge amount of ‘spaghetti’ from one courgette; it was enough for a small portion (it was pretty late when I got home from work that night and I didn’t want a big dinner at 9pm) but otherwise I would say this amount is more of a starter, side dish or small meal. For two people, I would do three courgettes. NB: Ideally you need to make the sauce, or at least the red pepper and tomato part, the day (or several hours) before. Line a baking tray with foil and spread around 1 tbsp oil. Cut the tomatoes in half and the red pepper into chunks and place face down in the pan. Roast for about an hour; I had my oven at too high a temperature so the skins on the tomatoes burnt, but they were very easy to remove. After an hour, add the garlic to the tray and roast for another half an hour. Remove the charred skins from the tomatoes and pepper and squeeze the garlic out of its skin, either into a small bowl or straight into a food processor. I did this part the night before so kept the ingredients in a bowl in the fridge. In your food processor blend the tomato, pepper, garlic, vinegar and rest of the oil, plus the basil leaves, nuts and salt and pepper. To make the courgetti, place the courgette in the spiralizer and turn the handle until you have what looks like spaghetti. You can eat this raw, according to the Hemsley and Hemsley recipe, but I preferred to warm it through in a frying pan in a little butter. Top with the tomato and red pepper sauce. For someone who has honestly never willingly eaten courgette, I was very surprised at how nice this tasted! I think it will take a bit of getting used to- courgette that is, not spiralizing –but I would definitely class this recipe as a success. Courgette is known in the US as zucchini but the name courgetti definitely sounds better for this dish! But since it does also begin with Z, and that is the letter I have chosen this month for Alphabakes (which I co-host with Ros of The More Than Occasional Baker) I am sending it in. 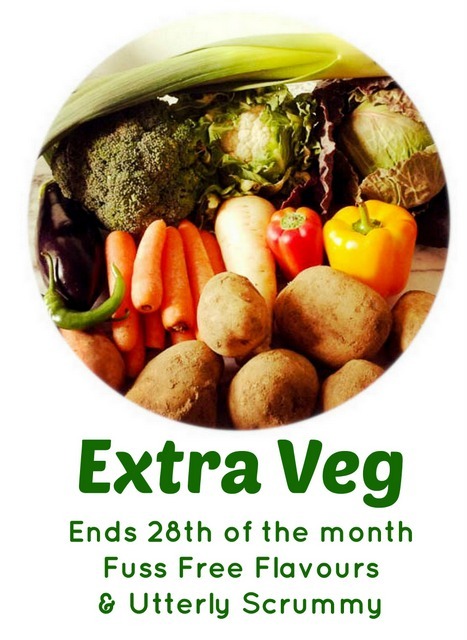 I'm also sending this to Extra Veg, hosted by Jen's Food, on behalf of Helen at Fuss Free Flavours and Michelle at Utterly Scrummy.